Daily cleaning of dentures is recommended due to Plaque and tartar build up on false teeth, as well as bacteria that collects within the base of the denture and surrounding teeth, just as they do on natural teeth. Cleaning can be done using chemical denture cleaners or professional cleaning and polishing that we provide in our office for no charge. 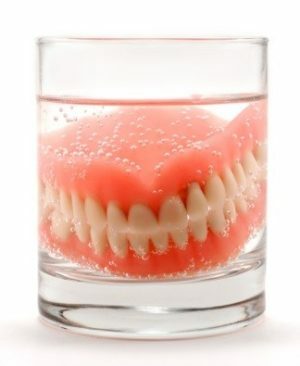 Make sure you brush your denture every day, just as you would your own teeth. You should use a soft to medium brush, which won't scratch the denture and your regular dish washing or hand soap and water. You can also soak your denture using a special solution or tablets. Remember, though, that you will still need to brush the denture to make sure it's really clean. You must rinse it before putting it back in your mouth.